It is the worst love story ever told. She wants a fairytale wedding, he promises to give it to her. Two families with two different orientations come together to forge an unlikely headway! The movie is about a girl who wants a grand wedding and her groom makes the mistake of boasting that he can foot the entire bill for the wedding! 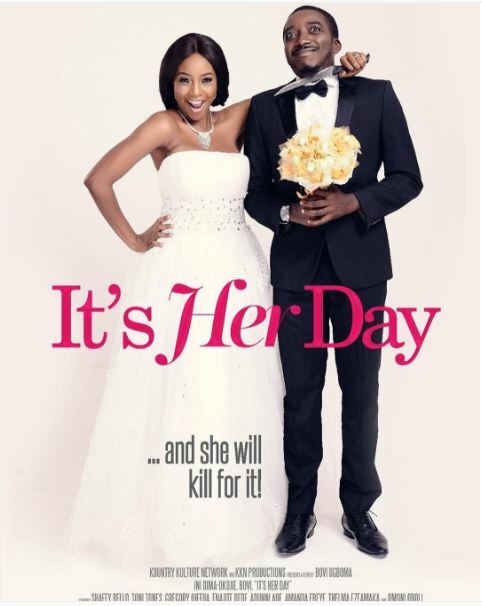 “It’s Her Day” features Bovi, Ini Dima-Okojie, Shaffy Bello, Toni “Tones” Adefuye, Amanda Ebeye, Thelma Ezeamaka, Enajite Dede, Omoni Oboli and more. The movie was written by Bovi Ugboma, edited by Akin Alabi and directed by Aniedi Anwah.